We were talking about social media and she said, "I always adhere to the rule: If you wouldn't say it at the front of an auditorium filled with people then you shouldn't put it on Facebook." I nodded in agreement. There is a fine line between sharing your life with people versus airing your dirty laundry. They're two very different things. We live in a day and age where within moments of typing something and the click of a mouse we can send our words out into the world. For the most part? It is awesome! There can, however be a downside. Social media doesn't always breed sincerity. Sometimes in an effort to be positive, or look better, or have people like you, or whatever it is, we only show our good sides. It's like a selfie, I guess. Who posts ugly selfies? Um, nobody. We don't want people to see us poorly. For most of us there is a real fear of what other people think. It's called Social Phobia. Yep, it's a real thing, with a real name. So we hide behind pretty pictures and clean houses and pretend to be perfect, because it feels safer. There's a problem with it though. It's hard to make friends when you don't open up and all you show is one facet of yourself. When what everyone else sees is an immaculate house, four course meals, perfectly groomed well-behaved children and someone who is always put together they're not going to relate. Nobody's life is immaculate. When you make friends, and I mean real friends you end up opening up. Maybe not at first, but eventually you break down the walls and start to talk about all the heartfelt stuff. The stuff that you really love, or that hurts, the stuff that worries you or that causes you pain. You start to get down to the core. You become vulnerable with them, and they become vulnerable with you. You show them your bad sides as they show you theirs. And it's really good. And guess what? You love them anyway. Bonus? Despite all your failures and shortcomings they love you too. One of the most enjoyable aspects of blogging is putting up all the pretty pictures. Pictures of my kids when they're smiling, pictures of the vegetables I just brought in from our garden, a picture of the one craft we did all month. Those pictures? They're pretty, they're nice, and I enjoy taking them (and posting them) - but they don't always portray what my life *really* looks like. After thinking on this for some time I realized that what I'm looking for a lot of the time is some authenticity. I certainly enjoy pretty pictures and other people's ideas of how to make my house more organized - but sometimes? Sometimes I really want to read/see something unfeigned. It makes me feel like I'm not alone in my frustration, struggles, and fears. 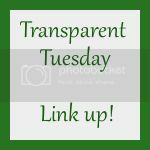 So, I decided to start what I'm going to call "Transparent Tuesday". A designated day where I can show an aspect of my life that is authentic, transparent. Some weeks it might just be a picture with a caption, on other weeks it might be an entire post. Regardless of what it is, it will be sincere. they will be more encouraged. It's time to make friends and get down to the nitty gritty. I welcome you to join me! Starting tomorrow I will have the instructions on how to link up! A great idea! I love that it can be anything transparent about our lives. :) Looking forward to the details tomorrow! I love love love this idea! I love the name of the link up too. Being transparent is so important! I hope toile some really great friends from this link up! Thanks for starting it! I would love for you to join! The more the merrier!